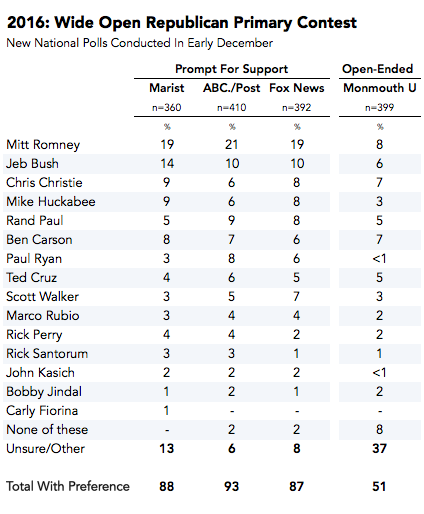 A flurry of presidential polling still finds support for Hillary Clinton among Democrats and no clear GOP frontrunner. The Republican Party's image is considerably improved post-election. And Americans are starting to hear better news about jobs. This is HuffPollster for Wednesday, December 17, 2014. 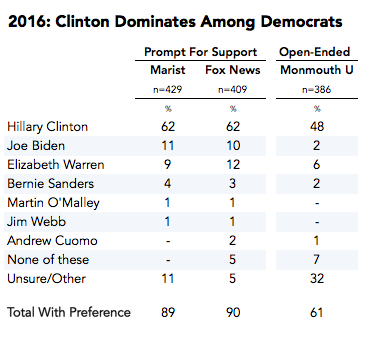 Clinton leads among Democrats - Former Secretary of State Hillary Clinton is the overwhelming favorite in the Democratic side, with just over 60 percent support when Democrats are prompted for their choice on the McClatchy/Marist and Fox News polls, and just under 50 percent on Monmouth's open-ended question. Although Clinton's dominance made it easier for Democrats to name a choice without prompting, nearly 40 percent were still unable to volunteer a preference. 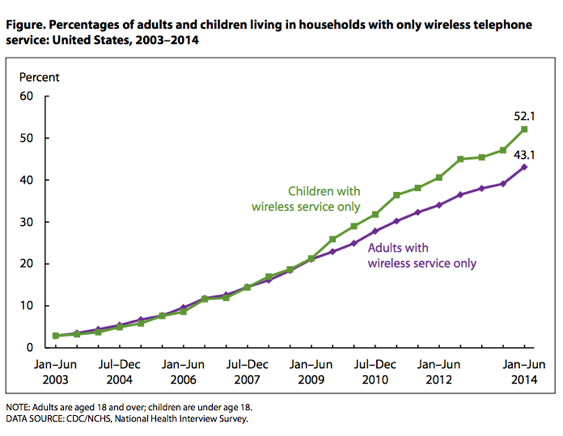 Cell-only rise resumes among young adults - Although young adults are the most likely to live in wireless only households, the two previous releases of the CDC-NHIS survey had indicated a leveling off of the trend toward cell-only use among adults under the age of 35 during 2013. However, on this latest update, the survey found the upward trend continuing, with increases of cell-only percentages of 4.8 percentage points among 18-to-24-year-olds (to 57.8 percent), 3.6 points among 25-to-29-year-olds (to 69.3%) and 5.2 points among 30-to-34-year-olds (to 64.9 percent).